To be able to contribute one of your tried-and-true beauty tips to The Coveteur is nothing short of a PRIVILEGE…but to see your name pop up in their beauty section TWICE feels like winning the lottery! 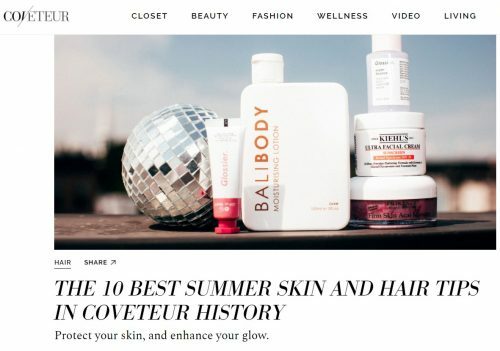 It is such an honor to see one of my favorite tricks featured in THE 10 BEST SUMMER SKIN AND HAIR TIPS IN COVETEUR HISTORY! I know I’m not the only self-tanner out there who has experienced a faux pas during the sunless process, and I hope this trick saves you all from feeling anything less than GORGEOUS from now on, from head to toe! Click HERE to get the step-by-step instructions! Katie has her own original product line with Kona Tanning Company, and has written three books on how to spray tan, how to contour in spray tanning, and how to market your beauty business. Her spray tan training DVD launched in June 2017, and Katie’s Complete Contouring Academy recently debuted to professional spray tanners everywhere.